This week on 60 Minutes, another unlikely character burst onto the national scene, courtesy of one of the lightest technologies profiles ever investigated on 60 Minutes by the otherwise redoubtable Lesley Stahl, who offered up the story of Xyleco, presumably as a proxy for the efforts of the bioeconomy to bring forward affordable renewable fuels and chemicals at scale. If the story was light as meringue and lacking in, apparently, the presence of a much independent as to the validity of the science, in my view there wasn’t much bothering about it back at CBS headquarters. You can look as much, but if you much as touch…well, you get the idea, don’t mess with CBS’ Toot Toot. Because 60 Minutes still commands an audience among thoughtful people of a certain age, the editor’s easy chair in Digestville was somewhat snowed under as this week opened with questions from people well versed in the companies of the advanced bioeconomy and the state of technology advancement. “That 60 Minutes piece is the most egregious piece of fluff. [They] has raised a bunch of money, and have Steve Chu, George Schultz and some other big names on his Board. Forgive my cynicism, but “Theranos” was the word that immediately jumped to mind. Mr. Medoff carefully studied this science problem. Inspired by natural forces including light and solar energy, he ultimately innovated and patented sustainable technologies that cleanly and inexpensively restructure biomass into a new material with a changed molecular structure. The sugars obtained from this new material produce a wide range of downstream building block products, as well as intermediate and final products to inexpensively house, feed, medicate, clothe and provide clean energy and the other necessaries, and together create a trillion-dollar global product market. Xyleco has established a multi-billion dollar valuation. Mr. Medoff’s Natural Force® technologies represent a transformative ethical and scientific breakthrough that use only non-food sources, significantly reduce the world’s greenhouse gas emissions and significantly increase the world’s sustainable resources. As a friend wrote of the style of company messaging: “major hyperbole”. Xyleco is Leading the Sustainable Industrial Revolution®. Xyleco’s wide range of innovative and patented technologies allow non-food biomass, agricultural and other waste, to be used as a feedstock to cleanly produce thousands of important and inexpensive products for housing, clothing, food, medicine, energy, materials and other necessaries. The company has world-class research and development laboratories, as well as a pilot production facility on 5 acres alongside Route 95 in Wakefield, MA, where the company innovates and demonstrates its technology. It also has a commercial plant facility on a 162-acre campus in Washington State, as well as engineering offices in the Bay Area and in Houston, TX. As the director, I managed and provided technical support for up to 8 employees in Washington, Texas, and California. My staff included mechanical engineers, process engineers, and project management. Unfortunately, the Washington facility was closed December 2018. A quick search of “Xyleco” in the patent databases brings up A LOT of issued US patents and international patents/applications. These things don’t get filed and prosecuted for no cost, and even if they were cheap (because they are new and not much prior art or competition) they are still $10-15K each, at least. He has spent a small fortune on IP. Now, a patent doesn’t mean that the process works in everyday application, or is affordable, sustainable, reliable and so on. Bottom line, years of effort that have been poured into this enterprise, and it’s wrong to dismiss technologies simply because they are surrounded by a board of directors that some find too associated with hype-machines of the past, or that they use terminology that makes some observers uncomfortable. 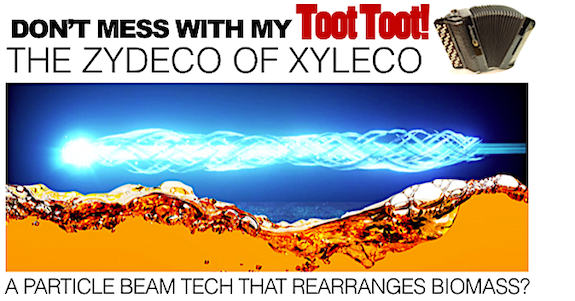 I have never heard of Xyleco or Medoff, but the technology looks plausible. E-beam devices are commercially available, used for a variety of purposes, and have been on the market for decades. I assume it just deposits a large amount of energy in a small volume over a very short period of time – which can (presumably) break specific bonds. E-beam technology is known to break polymers, including Teflon. There might even be a cost advantage; although not clear what it might be. There are no chemicals – OK – but you still have to generate the electron beam, and handle the input and output material. Yep, know a little of Xyleco. Unfortunate timing for 60 Minutes given that they reportedly just shut down their proposed commercial project site (near Richland, WA) last month and laid off staff. In general it’s been an odd story, almost a single guy for a number of years, the company displays, in my view, a penchant for control and security (it has applied for a few patents for a novel project financing system / investor interface, which strikes me as a little odd. Also, some of the company’s team chose to list the company as “Confidential Biotech” on LinkedIn employee profiles etc etc. I mean, how confidential is the pursuit of affordable fuels from lignocellulosic biomass, especially for one company that has filed numerous patent apps rather than hold the technology as a trade secret? Generally, the company has been focused on a system for converting low-cost lignocellulosic biomass into fuels — some work in developing chemical applications — with emphasize on particle beam bombardment as a technology to assist the deconstruction of biomass (possibly reconstruction), and some technical work on particle size reduction that I think Edeniq has already proven is a valuable angle of attack Also they have put together a smaller-scale “mobile production system” that, I kid you not, they propose might be moved around to biomass sources by blimp. Overall, anything that accesses negative-cost or zero-cost residues and did a through integrated demonstration is doing pretty well right now, Fulcrum, LanzaTech etc. However, enzymatic or other biochemicals approaches to tapping low-cost cellulosic biomass (e.g. wood waste, corn stover) have had trouble. Not really because of the core technology, when you get down to it. Most have foundered, maddeningly, at the front end, at the throat of the reactor, like a guy with a perfectly good digestive system trying to eat a watermelon in one swallow. The part where you convert the reactor’s “food” into “energy”, that’s not really been the problem. What we’ve heard again and again is that there’s been too many darn rakes, dirt, and tennis shoes coming in with the bales of stover, and it’s been tough to liquefy the biomass quickly and throughly enough with an affordable technology. The former? It’s being addressed with better biomass prep. The latter? It’s something that Leaf Resources, Sweetwater Energy, and Renmatix have been hard at work on — among others. The goal for all is the same — as homogenous a stream of sugars or pre-sugars as possible, as enzymes are finicky. Because of all the process improvements that cellulosic technologies have been hard at work on, the thermochemical systems have had better luck where they can find high priced fuel markets such as California. Xyleco has an interesting approach but I don’t see that they will have any more near-term success with chemicals application development or homogenizing low-cost biomass prior to entering the reactor than anyone else — what’s been done in the lab has been hard to replicate in the field, at scale. I suspect they may founder on the same rocks as the others. Meanwhile, they have a pilot, but I haven’t seen an integrated thousand-hour demonstration of a technology, and that will be required by project investors. Who will also have the same investor objection s as they’ve been voicing about policy stability since the Obama Administration embarked on an eight-year odyssey to de-emphasize lignocellulosic R&D spending and introduce unreal levels of uncertainty into the Renewable Fuels Standard, especially as it pertained to cellulosic fuels. Investors worry about policy risk, supply chain risk, tech risk, country risk, currency risk and more. A good technology is table stakes, and not much more, these days. It’s the project that makes the difference, whether you are focused on rural development, energy security or greenhouse gas emissions. I always am very happy to hear about transformative technologies and am always hopeful that one of these companies will make the grade. In terms of the tone — Xyleco is Leading the Sustainable Industrial Revolution seems a little premature — the tone is similar to what I recall of Cool Planet and Joule and feels, speaking for myself, like a company gearing up for a big cap raise and trying to talk up the book value to avoid dilution. On the other hand, stealthy companies always look a little weird and there’s a good chance that I am simply missing the inner beauty of the process and its business prospects. There certainly were a raft of technologies I would have rather Lesley Stahl go riding around to look at, last one I think she did was KiOR, which also had a very high profile board, before they all skedaddled. The cynic in me says that 60 Minutes producers are impressed by board credentials more than science, but cynicism isn’t scientific, either. Everyone benefited by giving search engine technology the benefit of the doubt, so I’ll await more hard data, and wish this one well as with all the others.